Everyone stresses out...it is a normal part of life. However, how people manage their stress varies from person to person. Here are some tips for managing and reducing your stress levels for 2019! Exercise is one of the healthiest ways to relax your body and your mind. Exercise causes your body to release “feel-good” endorphins, and can help reduce depression, regulate your sleep schedule, and boost your energy, all of which help you remain calm and reduce your stress. When you are busy/stressed, it is easy to skip the gym, so try to develop a regular exercise routine and make it a habit! These are all common crutches people rely on when they are stressed. The stressed out chain-smoker, going to happy hour after a long day at work, pounding cups of coffee to meet a deadline, or constantly stress-snacking. Everyone has seen someone who does these when they are stressed (and a lot of us are guilty of one or more of these ourselves). 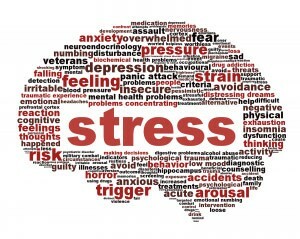 That being said, relying on caffeine, nicotine, alcohol, or refined sugars will not reduce your stress level. Try to avoid (or at least reduce) your intake of these substances when you are stressed. Try to replace alcohol, coffee, soda, and high-sugar juices with things like water or tea. And replace the sugary snacks with a healthier alternative. The relationship between stress and sleep is a frustrating one. A lack of sleep increases our stress level, and stress tends to inhibit us from sleeping well. Try to avoid sleep medications when possible, and relax as best you can prior to sleeping. Excessive alcohol and caffeine disrupt your sleep, so try to avoid those in the evening. Try taking a warm bath, reading, or meditating before bed and see if that helps you fall asleep. In addition, try to go to sleep and wake up around the same time each day! Try to determine what is causing you the most stress. Is it school work, your job, etc? Once you identify your stressors, you can begin to take the necessary steps to reduce or eliminate them from your life. Keeping a stress journal may help you determine what your major stressors are! Try a few of these techniques and see if you feel less stressed. Remember a lot of these are habitual changes, so it may take some time for you to notice a difference. Good luck!! !